Tuesday night, President Obama outlined his economic initiatives in a speech to the nation. Will the President’s plans to help boost the national economy be successful? And how long will it take for the economy to show signs of recovery? 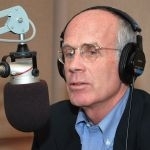 Bob Kinzel talks with Congressman Peter Welch about the nation’s economic situation, the wars in Iraq and Afghanistan and how the new Federal stimulus law might benefit Vermont’s renewable energy industry. Also in the program, reporter analysis of the Vermont Yankee Decommissioning Fund and the plant’s re-licensing and the budget issues facing the state. Do you have any idea who the decision-makers will be and how they will decide to use stimulus funds for education in Vermont? remember that the sterling example set for us by South Africa was that it was a "Truth AND RECONCILIATION" commission. Anyone who testified before that commission was exonerated for any laws they might have broken. There were two important results: the citizens got the information they needed about violations of human rights, and the cycle of evil-doing and retaliation was stopped. We should do the same. school buildings that need work up to current building codes? I am in charge of buildings and grounds for our local school and have buildings (one of which was built in 1860) that could really use this help. attract trillions of dollars on the world market? $1 million in bonds in 2007 to $9800 per $1 million in bonds in 2009? professional bond investors? I look forward to hearing the Congressman’s answers. can afford the cost. This must be true in other areas of Vermont. Our course is offered by a certified instructor). generic use of the term ‘hybrid vehicles’ in the package. I hope Mr.
Malibus are more expensive than the equivalent non hybrid Malibu. Malibu hybrids will COST us money. The Vermont House has passed legislation to boost Vermont’s renewable energy industry – over the objections of Gov. Jim Douglas and some business leaders.